Fresh, Hearty & Perfectly Balanced! 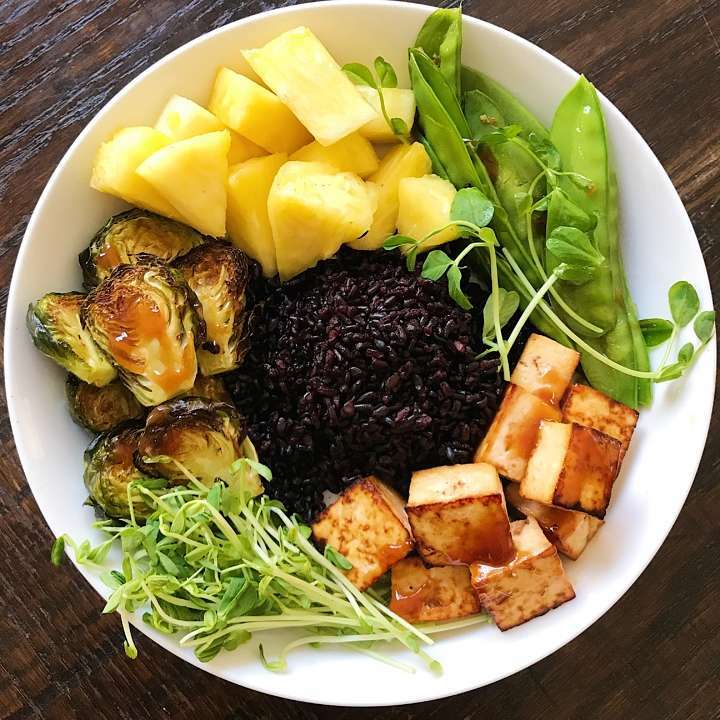 What started as a stir fry ended up as a Buddha Bowl for me and I’m not complaining… roasted sweet & sour tofu, roasted Brussel sprouts, sautéed snow peas, black rice, and pineapple with a homemade sweet and sour sauce. A fresh, hearty and perfectly balanced bowl… a little sweet, a little tangy, a little savory and a little nutty. The rest of the crew ate sweet & sour stir fried snow peas and chicken. A fresh, hearty bowl that is perfectly balanced. Roasted sweet & sour tofu, roasted brussel sprouts, sautéed snow peas and fresh pineapple served with black rice. Sweet and Sour sauce recipe adapted from Eating Well. 1 cup forbidden rice, prepared according to package. Make twice: First whisk together pineapple juice, vinegar, tamari, ketchup and sugar in a small bowl or liquid measuring cup until smooth. Set aside as tofu or chicken marinade. Pour in the some sauce and cook, stirring, until thickened, about 30 seconds. Toss brussel sprouts in oil and spread evenly on a prepared baking sheet. Sprinkle with salt. Bake at 400 degrees, 25-30 minutes or until starting to get crispy around the edges. Place rice in center of plate or bowl. Place cooked tofu, snow peas and brussel sprouts around rice. Add fresh pineapple and pea sprouts. Drizzle with additional sauce as desired.